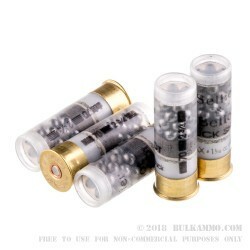 This 12 Gauge shotshell by Sellier & Bellot is loaded with 1 ¼ ounces of #4 buckshot. 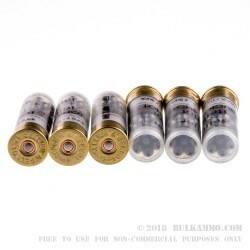 At .24” diameter each, these pellets are just the ticket for home defense. They’re remarkably destructive at close range, but don’t pack quite the punch it takes to break walls like its bigger brothers are known to do. 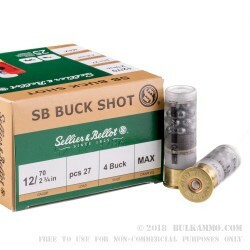 #4 buckshot may not be quite as effective at long ranges like 00 buck is, but therein lies its self-defensive nature. This is not to say #4 buckshot only belongs by the nightstand! You’ll certainly be able to drop deer and larger varmints reliable with this shell as well. Sellier & Bellot has been in business since 1825, making it the oldest operating ammunition company in the world. In its nearly two centuries the Czech manufacturer has perfected the art of making its own components from raw materials, which along with their scrutinous quality control program lets them build fantastically precise shotshells. A: Hi Lucky, Based on current information available from the manufacturer, this product has a Muzzle Velocity (FPS) of 1181.